An Evening at Hacklab.to | Inventing Situations. 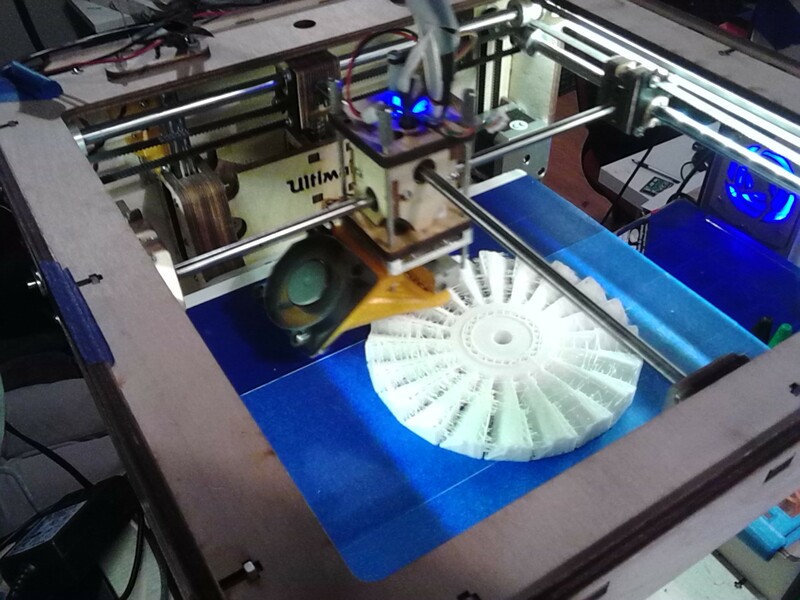 A 3D printer at HackLab printing a model of a jet engine turbine. On Tuesday evening I finally made it to the Toronto Hacklab, after meaning to make it over for weeks! It’s a really interesting space. There are currently five 3D printers, lots of tools for playing with electronics, and a giant computer-driven laser in the bathroom for etching and cutting plastic or acrylic. (Actually, I should try to make an acrylic LakeHub logo to send back to Kenya….) According to Eric, who gave me a tour of the space, about a two thirds of the members come through to work on these sorts of projects, and a third are mainly software people who use it as a common work space. The space is funded entirely by membership: it’s $50 a month to become a member, which gets you round-the-clock access to the space and a bin that you can keep your current project in. For non-members, there’s an open-house every Tuesday with tours for new visitors (like me!) and a nice vegan dinner. Due to the bunch of expensive and easy-to-break toys lying around, becoming a member requires vouching from the current membership. It’s an interesting model: they’re completely free from obligations to corporate sponsors or a hosting university. The space is also completely volunteer-run: everyone involved has other jobs that pay their bills, and it sounds like there’s no paid staff. When it works, volunteer based models can be quite awesome: so long as there’s sufficient enthusiasm for the space, the project will continue to thrive. On the flip side, this means that there’s no permanent staff doing things like outreach or dreaming up new events or interesting ways to expand. It’s a cool, funky space in the middle of the city, totally independent and likely to stay that way for the forseeable future. On the whole, it’s like someone took iHub and Bike Pirates (an anarchist bike shop I’ve worked with in Toronto) and shook them up in a blender. It’s an awesome space, and I’m looking forward to going back! I haven’t run into New Work before; it looks interesting, though. There’s definitely space for building things outside of the mainstream economy, which I think is what spaces like Bike Pirates and HackLab do well.